Leaves skin lighter and even. 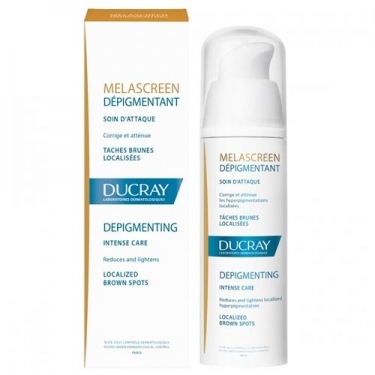 DESCRIPTION: Melascreen Dépigmentant Soin D Attaquen from Ducray is an attack care concentrated in depigmenting active ingredient (azelaic acid and glycolic acid). It is used to correct brown spots on the face, neckline and back of the hands or marks that correspond to the excess of sun. It is thus an intensive anti-spot treatment, which allows a clearer and more homogeneous complexion. Active Ingredients: Azelaic Acid and Glycolic Acid. Not suitable for pregnant women. No perfume and no parabens. Hypoallergenic. Non-comedogenic.